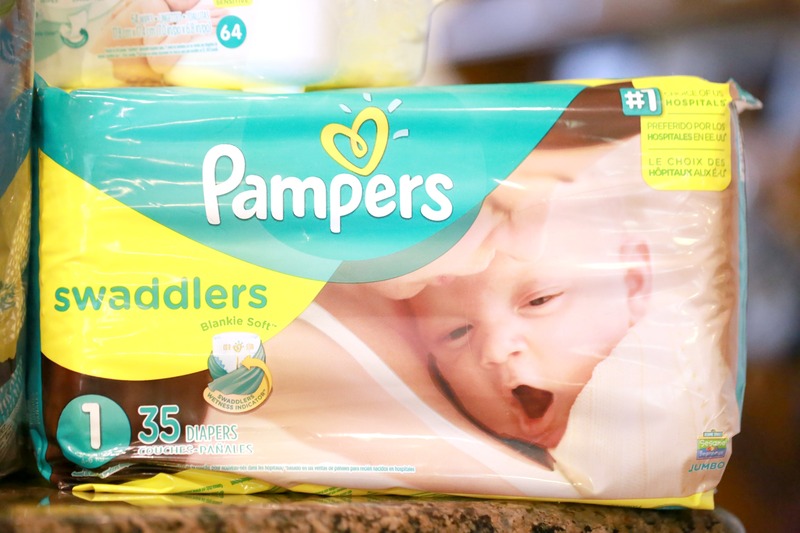 This is a partnered post with Pampers. As always, all thoughts and opinions are my own. Expecting a baby can be a very emotional time. From nerves to excitement, the emotions a pregnant woman feels can not be compared to anything else. As excited as I was with each of my pregnancies, each one brought about new doubts, new worries, and new expenses. The overwhelming list of baby products can be a little intimidating, causing worry, frustration, confusion, and a jumbled mess of a baby registry. A jumbled registry can lead to getting items you either don’t need, or won’t use. With my first child I added every single item I thought I would need. So I’m sure you can imagine that registry. Pages, pages, and pages of every single item on the shelves. My thought was, if it’s available, then I need it. In a recent Pampers survey, 9 out of 10 moms wish they included more everyday needs like diapers on their baby registry. Because let’s face it — you’ll need diapers for years. 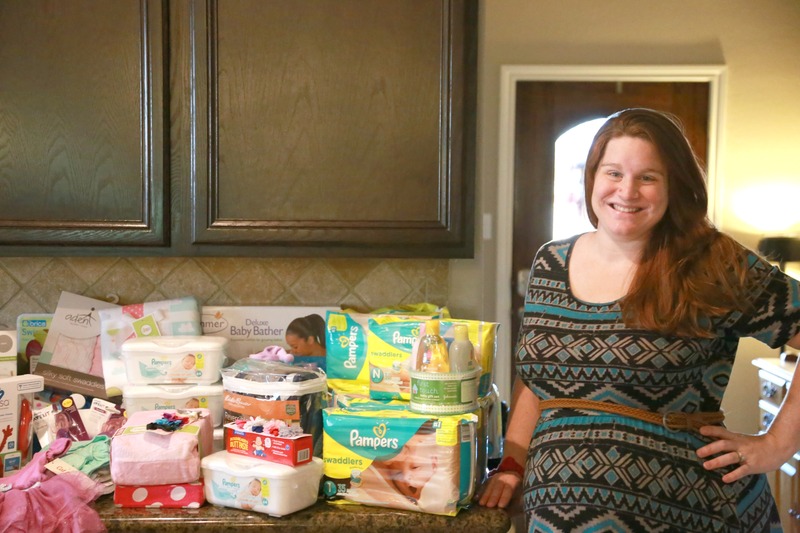 The survey also found that when looking back, nearly half of moms said that diapering items including diapers, wipes, and changing pads were the baby registry gifts they used most often, yet more than 1 in 3 felt guilty about registering for them. During your years of parenting, I’m sure you’ll have many regrets, but lets not make your baby registry one of them. Diaper Bag for Him: We all know the diaper bag is for you, but you want his help, right? If you want him to carry the diaper bag, don’t opt for a bright pink bag with neon flowers. 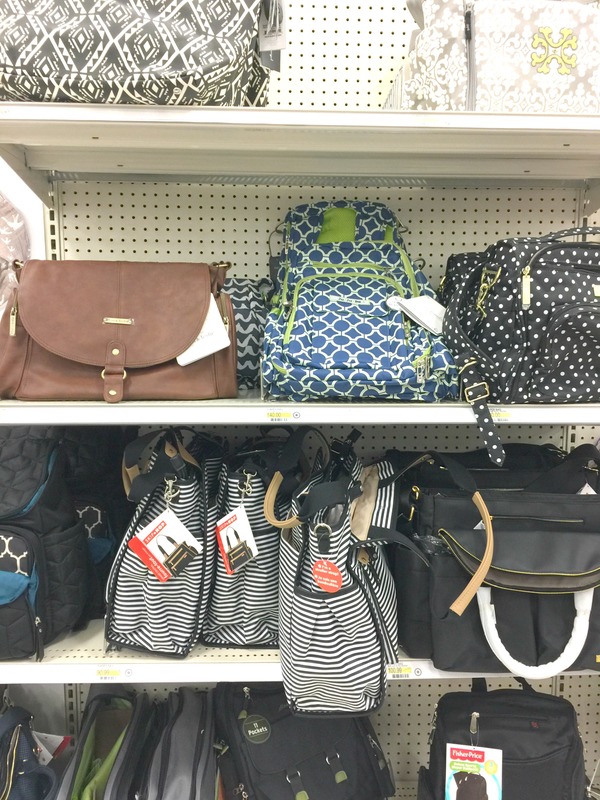 I know it’s tempting to get the most feminine bag on the store shelves, but opt for a bag he will feel comfortable toting around. Peepee TeePee: If you’re having a boy, Peepee Teepee’s are an absolute necessity. It only took one time of getting sprayed by a little boy, to realize these bad boys should make it on a list of what not to forget on your baby registry. Infant Bath Tub: Wet babies can get really slippery. An infant bath tub is a must-have. There are so many different options to choose from, so this one is personal preference. You can spend as little as $20, upwards to over $100. Because I’m practical, I think a small, easy to dry option works best. Pampers Diapers: Out of everything you’ll register for, diapers should definitely top the list of what not to forget on your baby registry. Because I’ve found Pampers diapers are the softest, register for as many packs as you want in varying sizes. I’d probably skip the newborn size because people usually buy those anyway, and register for the bigger sizes you’ll need later down the road. If your baby outgrows a size, most stores will allow you to exchange for a larger size. Aden + Anais Swaddle Blankets: These are the softest, most amazing baby blankets I’ve used yet. They’re a little on the pricey side, but they’re so worth it. Unlike the traditional baby blanket, these are generously sized making them perfect for a stroller blanket, nursing cover-up, changing table cover, burp cloth, tummy time blanket, and more! Bottle drying rack: Even if you’re breastfeeding, a bottle drying rack will come in handy. You might not be drying bottles, but think drying pacifiers, medicine droppers and teething toys. Baby seat: Before you know it, you’re little one won’t be content just laying around on a blanket on the floor. They’ll want to be sitting up where the action is. When my babies were little, the Bumbo came in handy. Not only did it allow my hands to be free to cook and clean, it allowed baby to feel like they were still being included even though they weren’t being held. Wrap or Baby Carrier: When it comes to wraps and baby carriers, there are options galore. What it comes down to is personal preference. Like a baby seat, a baby wrap or carrier allows your hands to be free to do other things. Even though all you want to do is hold that sweet little baby, the dishes still need to be washed and the laundry doesn’t fold itself, unfortunately. Activity Center: As your baby grows, they’ll need more stimulation. They will want to touch and feel and put all the things in their mouth. Having an activity center allows baby to do all those things in a safe, controlled environment. That stage between holding their heads up unassisted and walking can be difficult because they’re wanting to explore. Depending on the activity center, they’ll experience sounds, lights, and more! Baby Safe Cleaning Products: Babies slobber and babies spit up no matter where they’re at or what they’re doing. You’ll need baby safe cleaning products to clean their high chair, activity center, baby seat, etc. There are a variety of options available. 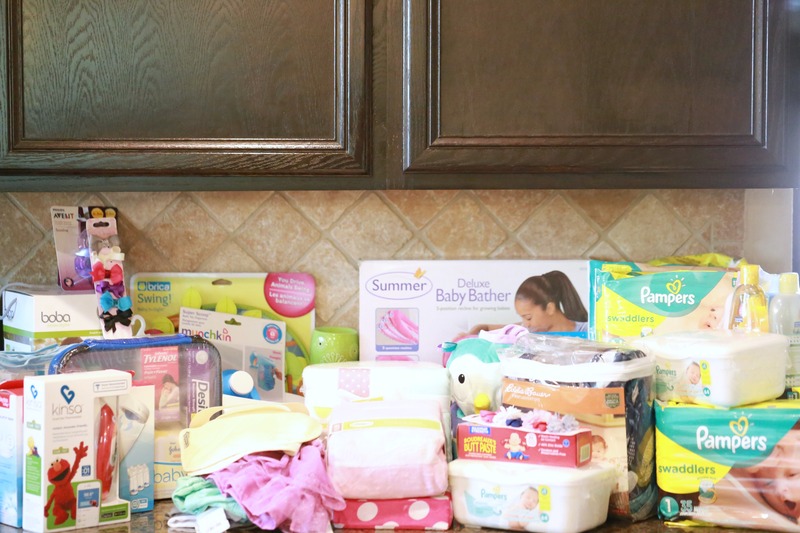 In partnership with Pampers, I was able to help an expectant mother with her baby registry. While she had already registered for everything she needed for her baby girl, I was able to purchase many items off her list. With only a few more days until her little bundle of joy arrives, she was overwhelmed with the generosity of Pampers and their commitment to reaching out to the community. 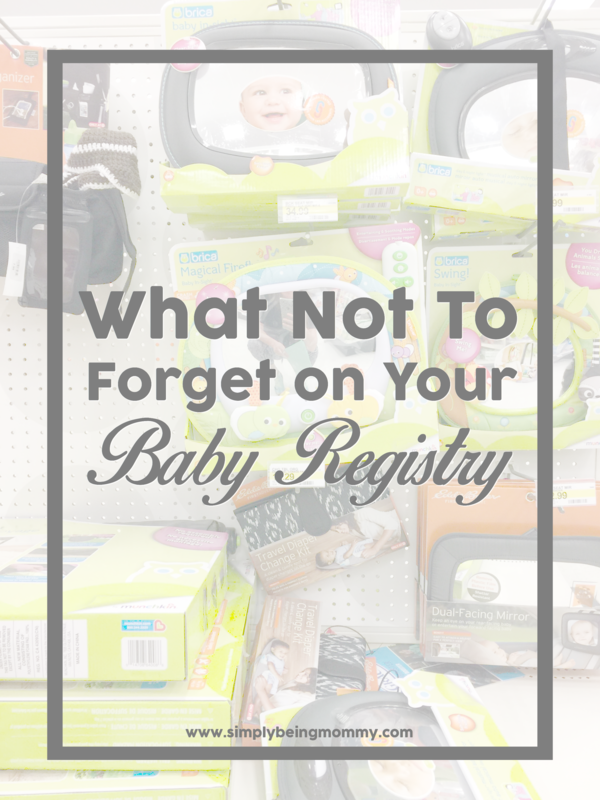 What would you add to my list of what not to forget on your baby registry? Always overwhelming! You need so much and it’s hard to remember it all. This is a great list! A men’s diaper bag is an excellent idea. They have to change diapers, too! This is a great list of items that you will need. Pampers was the only brand of diapers that we used. I actually just received my presents from my baby registry and totally forgot about diapers! We received a diaper cake, though! It’s really fun! These are must have for a new mom. Pampers is a great brand of diaper. I definitely could have used more practical items like diapers. I ended up with a ton of clothes and lotion that we never completely went through. A baby registry is a great way to let people know what you need. I will have to share this with my friend. She just found out she is expecting twins. This is such s great list! I’m going to share it with my girlfriend who is expecting her very first baby and feeling totally overwhelmed! Wonderful list! I’ll be honest someone got me peepee teepee’s for my 2nd son and I never used them. So I saved them and used them a few times with son #3 but I’d always forget to use them! This is a wonderful list for woman that need somewhere to start on this scary journey. I have most of all of these items and i can say they are very necessary. What a great list of ideas, I wish this was around when I was registering. Especially as a new time mom, this can be totally overwhelming! I needed this list when I was having kids! Having a baby is crazy enough without all of this too! I loved the white gerber cloth diapers to use as burp rags. Wow I think you covered it all! You can definitely not have enough diapers!